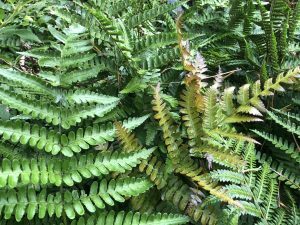 Fabulous Ferns to Know and Grow - Surfing Hydrangea Nursery, Inc. Being a professional gardener on Nantucket is a challenging career. Most of our clients only spend a few months on the island during the summer. Because the landscape as a whole must look fantastic for these few months, there is a lot of pressure on gardeners to keep the sunny border in full bloom from June until Labor day. There are many ways this can be achieved, but it’s an ongoing process of planting, fertilizing, deadheading, staking, spraying various repellents and insecticides and replacing plants. We battle the unpredictable weather, salty winds and never ending barrage of deer and rabbits who want to gobble up the flowers overnight. Everything can be so much easier in the shade. There is far less emphasis on COLOR! COLOR! COLOR!, allowing the gardener to focus more on combining textures to create a calmer atmosphere. Astilbe, Hosta and Alchemilla are well-used in Nantucket’s shady gardens. But for me, ferns are some of the most successful plants for the shade. Most thrive in dead shade where many other plants simply won’t grow. Many will grow in very wet/boggy soils. Others tolerate the dryer conditions under the canopy of mature trees. They are very low maintenance, only requiring a clean-up once a year. They are seldom bothered by insects of any kind. They combine easily with other shade-loving, broad-leafed plants like Hosta and Brunnera. Some are even evergreen, providing four season interest. And, unlike hosta, deer and rabbits seldom browse ferns. 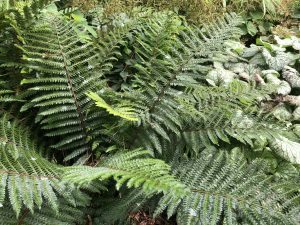 LADY FERN, Athyrium felix-femina cvs: This useful medium-sized fern (2-3′) grows best in fertile, moist soil with good drainage in light to dense shade. It’s lacy fronds are a pleasant light green arising from a round clump. It will tolerate full sun, with ample moisture, and is one of the few ferns that will thrive in the dry soils under large shade trees. If grown in ideal conditions, lady fern will slowly form a colony that completely covers the ground. Try ‘Lady in Red’ for a contrasting red stem. JAPANESE PAINTED FERN, Athyrium nipponicum cvs: This small to medium-sized (18-24″), colorful fern is best grown in fertile, evenly moist soil in light to dense shade. 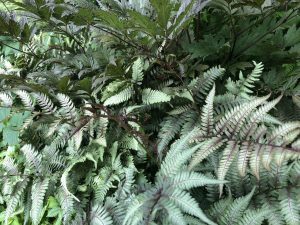 The most striking feature of these ferns are their purple and silver coloring which contrasts well with other shade plants. These are best kept in dappled to full shade as they will scorch in the sun. The most readily available cultivars are ‘Pictum’, ‘Branford Beauty’ and ‘Ghost’ but ‘Burgundy Lace’ is also a stunning plant to try. HAY-SCENTED FERN, Dennstaedita punctiloba: This tough small (to 2′), native fern is being spec’d more and more for large scale planting. It grows best in moist, fertile, soils in light to dense shade. It’s upright to arching, lacy, triangular fronds are a pleasant light green. If kept evenly moist, this is a fern that will tolerate full sun and poor soils. OSTRICH FERN, Matteuccia struthiopteris cvs: Ostrich fern is a stately addition to shady gardens with minimal exposure. 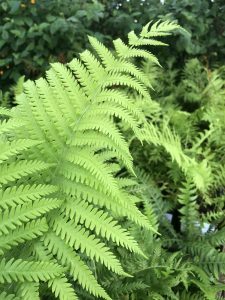 These ferns have tall (3+’), medium/light green, erect, delicate fronds that are particularly suited to deep shade and moist fertile soils. As they mature, the black root stock begins to rise above the soil level. Never attempt to shorten the root stock, this procedure generally kills the plant. Working with these ferns over the years, I’ve found them to burn out in August unless grown in deep shade, with constant moisture. 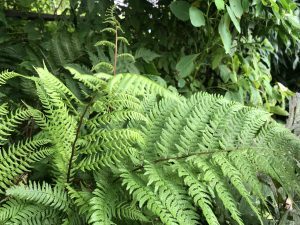 The fronds are also prone to easily breaking, so they are best used in the back of the shady garden, where they are less likely to get damaged. Try ‘The King’ in areas where burning out is a concern; this cultivar seems to do better than the species in dappled light. 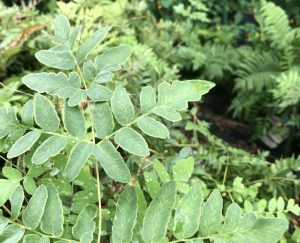 ROYAL FERN, Osmunda regalis: These ferns are a New England native, performing well in moist, fertile soils in dappled to deep shade. Depending on conditions, they will grow between 2 and 5′ tall with a loose spreading habit. Royal ferns have a unique look among ferns; the fronds have leaflets that are much rounder than others, resembling plants in the pea family. Their fertile fronds rise above the foliage, contrasting with the medium green leaves. Like ostrich ferns, these ferns will form a root stalk as they age that should not be disturbed with pruning of any kind. JAPANESE TASSEL FERN, Polystichum polyblepharum: I’ve always admired this evergreen fern for it’s glossy green leaves and rounded habit. In our garden it forms adjoining clumps that are 2′ tall and about 3′ wide. We leave the foliage until spring to clean up, trimming it off before new fronds emerge.